Can You Prevent Stretch Marks With Olive Oil? You'd like to avoid the stretch marks that can appear on your torso, breasts or thighs during pregnancy, adolescence or weight gain, but the odds aren't in your favor. Cochrane Database of Systematic Reviews reports they affect 50 to 90 percent of all women during pregnancy and that topical treatments aren't effective in preventing them. Olive oil is sometimes recommended as an easy home remedy to keep the reddish marks at bay, but research suggests it isn't effective either. The reddish brown stripes or lines called stretch marks may look rougher than the rest of your skin and take on a glossy appearance. When your skin's normal collagen production is interrupted, these stretch marks can occur. Collagen is the primary protein that makes your skin elastic. Although olive oil lubricates your skin, it can't prevent the collagen disruption that causes the stretch marks. Research has been performed on possible remedies for preventing stretch marks. A study in the August 2011 issue of Complementary Therapies in Clinical Practice tested the effects of the topical application of olive oil on women during their second trimester of pregnancy. Those who applied olive oil to their skin experienced approximately the same chance of developing stretch marks as those who did not use olive oil, leading the researchers to conclude that olive oil is not effective in preventing stretch marks. Olive oil is only one of many promised topical treatments to prevent stretch marks that doesn't work in practice. 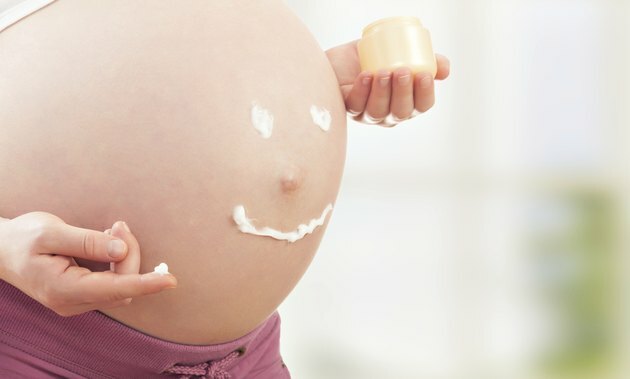 The Cochrane Database of Reviews looked at six studies examining potential creams and oils to prevent stretch marks in pregnancy and found that none were effective. This review included studies that looked at olive oil as well as cocoa butter, Alphastria, Trofolastin and Verum. Although stretch marks can be of aesthetic concern, they don't cause you harm. Stretch marks fade over time to a white or silvery color -- becoming less obvious. While you can't avoid a growing belly during pregnancy or rapid growth spurts during your teen years, you can try to maintain a healthy weight at other times to prevent stretch marks due to obesity. Is It Possible to Get Rid of Cellulite & Stretch Marks?